JANE GRIGSON was a self-taught cook – as, doubtless, are most of her readers – she learnt how to prepare food from consulting books or from friends and from her family. Jane was principally interested in domestic food and home cooking and when describing how she cooks she is a comforting presence in one’s kitchen. She is always cheerful and you can almost hear her peals of laughter at the numerous idiocies of modern life. Compared with recipes written by a chef, Jane is especially alert to the unexpected or puzzling elements sometimes encountered when cooking from a published recipe. “If the filling rises alarmingly, do not worry. It will fall when you take it out of the oven” is a reassuring footnote to a recipe for Old-fashioned Apricot Tart. And how endearing of an author to confess that she always offers up a silent prayer when baking a souffle. In the course of writing her seven principal works Jane researched and tested thousands of recipes. Here, we have chosen some of our favourites. From Food with the Famous, originally published in 2018. It's hard to have a favourite Jane Grigson book, but 'Food with the Famous' is one that I've dipped in and out of for so many years my old Penguin copy has completely fallen apart. But I still love the blend of acute culinary observation, gentle wit, literary context and ongoing relevance of the recipes she includes. The dessert at Gervaise’s squalid wedding wedding meal – an ‘extra’ which caused argument when the bill was presented – was ‘oeufs a la neige’, eggs in the snow. Being considered rather grand, it was greeted with a respectful pause, though as it turned out the egg whites had been overcooked (take warning). There is some argument in France as to whether you should poach the egg whites in the milk destined for the custard. Or whether you should first make the custard and then poach the whites in water. I think the second method is easer, and it seems to make no difference to the flavour. Separate the eggs into two basins. Bring milk, cream, vanilla pod and 125g (4oz) sugar slowly to the boil. Whisk it into the beaten egg yolks, then pour the mixture back into the pan and cook over a low heat until the custard thickens, coating the back of the spoon. Taste and add more sugar if you like. Strain into a large shallow dish, leave to cool, then chill in the refrigerator. Whisk the whites until stiff, then put in 450g (15 oz) vanilla sugar, bit by bit, as if you were making meringue. Put on a wide pan of water to boil. Adjust to simmering point. Poach ‘eggs’ of the meringue, shaping them with two tablespoons and slipping them into the water. Turn with a skimmer. Place them, sell drained, in a pile in the middle of the custard. Tryout an experimental ‘egg’ first, to see how you go: do not despair if the final pile looks a little raggy. 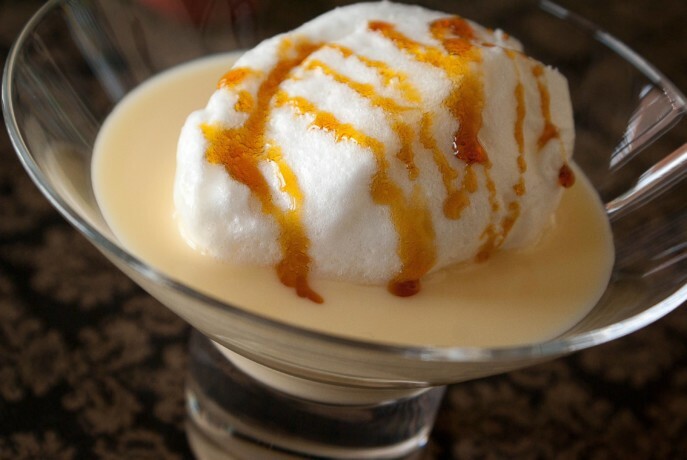 Cook some sugar with a little water to a golden brown caramel and dribble it down the ‘eggs’ – this turns the dessert into ‘ile flottante’ or floating island.